29th March 2018, New Delhi: The government has introduced an important legislation, the National Medical Commission bill (NMC) to change the state of the affairs in medical sector. Currently, there are very few regulations governing the medical sector. The Medical Council of India (MCI) is responsible for giving permission to new medical schools and regulating the doctors but has failed in some of its responsibility and is to be replaced by a new body. 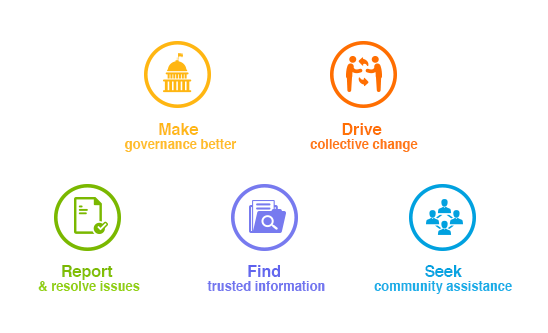 LocalCircles asked citizens on its platform about the various issues surrounding the new legislation through a large survey which received more than 42,000 votes. The bill wants doctors to renew their licenses every three years and keep up to date with the latest developments in medicine. To the question on this an overwhelming 83% citizens agreed while 12% disagreed and another 5% said they can’t comment. The NMC bill also frees up the medical colleges and allows them to charge any quantum of fees for 60% of the seats. 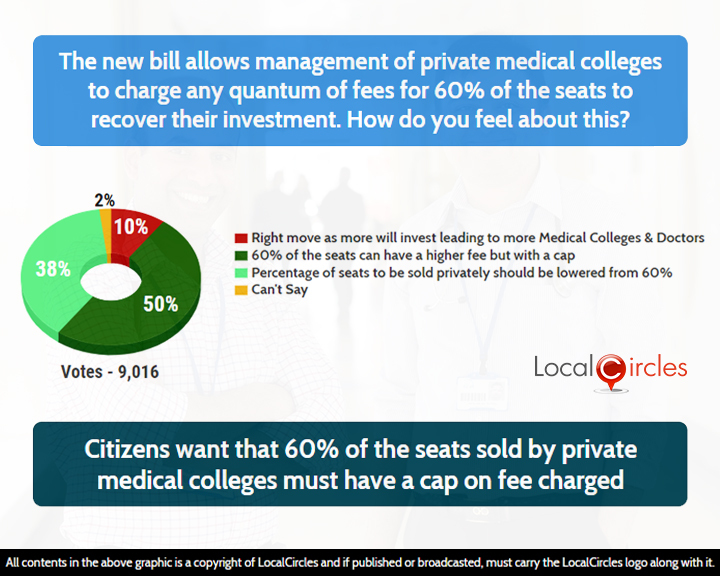 Half the citizens who polled said that fees can be raised for 60% seats but there should be an upper cap and 38% said percentage of seats to be sold privately should be lowered. 10% felt it is the right move as it will lead to more investments in medical colleges. *In the March 28, 2108 amendment, the number of seats that can be sold by private medical colleges has been reduced to 50% from the earlier 60%. 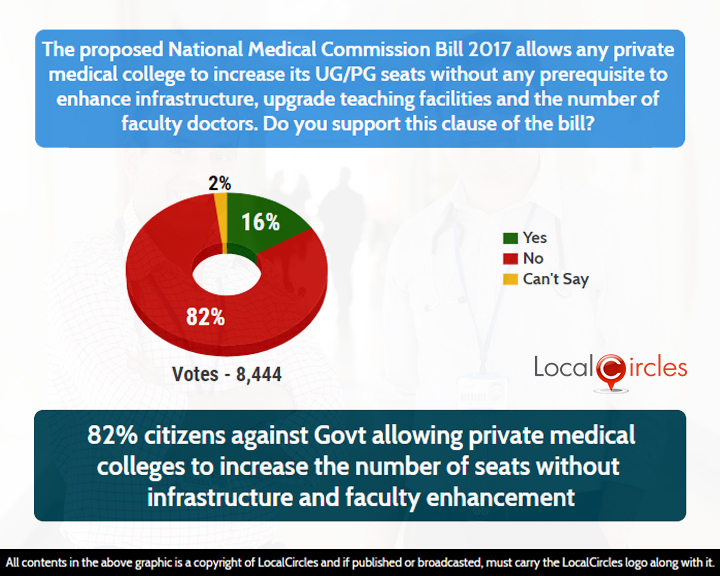 The bill also allows medical colleges to raise the number of seats without any upper limit or any condition of infrastructure enhancement, 82% of the citizens opposed this and only 16% supported this condition in the bill. 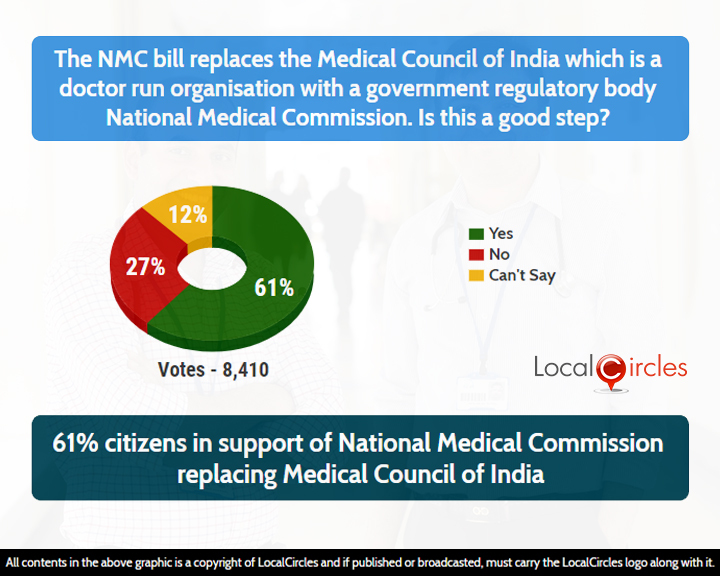 One of the biggest opposition to the bill by the Indian Medical Association is that it will make Medical Council of India (MCI) redundant. Around 61% citizens supported this move. 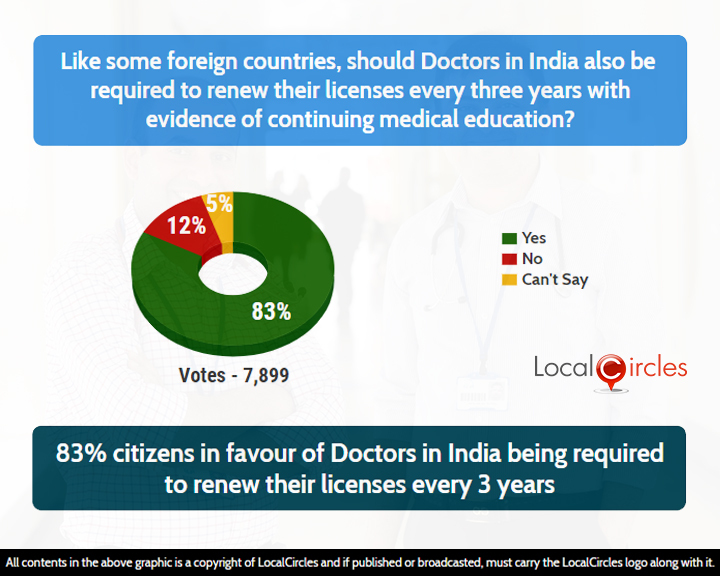 This could be because the MCI has failed in regulating doctors, healthcare providers or even medical education in the country. 27% opposed this move. 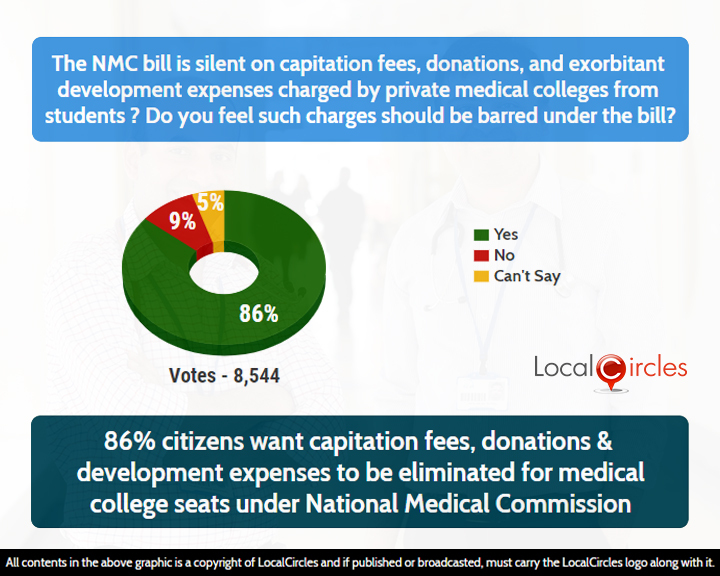 The NMC bill does not refer capitation fees, donations, development expenses etc. charged by private medical college in medical education. 86% of the citizens wants such fees to be banned. Only 9% said they don’t think it is a problem. Doctors in different parts of the country have been protesting against the NMC bill, calling it ‘anti-people’ and saying it would lead to mushrooming of sub-standard medical colleges and doctors which would in turn endanger the lives of patients. Doctors are also planning a big protest in Delhi on 25th March to show their discontent against the NMC bill. The above survey was conducted during the period Feb 15 – March 19, 2018 on the LocalCircles platform and participants responded via computer or mobile phones over the internet. Citizens from over 221 districts across India participated in the survey and 66% participants were males while 34% were females. Over 45,000 votes were received from over 15,000 unique respondents across India.